Hillary Gets California Support: A small contingent from Camp Clinton were showing support for their candidate over the 101 on Main . . –– They were greeted with an occasional honk from drivers, and a few choice words from others. Team Clinton may have prevailed . . –– King Taco Worked? : While Clinton was being projected as the winner over Obama, CBS news reported that 29% of those voting in California were Latino; a record turnout . . –– Glitch the Vote: A number of speed bumps with reports of polls not open on time or voters not familiar with Downtown didn't anticipate having to pay for parking, says the LAT. 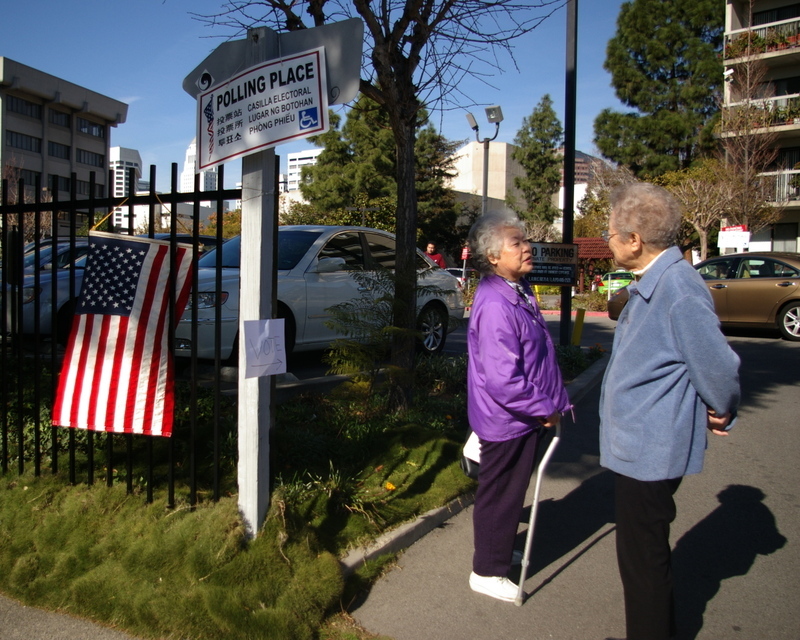 Diversity VIllage: Little Tokyo Towers were prepared to assist voters in five languages; Japanese, Chinese, Vietnamese, Korean, Spanish and English . . –– One problem. While the pens supplied by L.A. County were plentiful, they were dried out. Mission Rescue: The skid row polling spot saw just-released- from-County Richard Mannel––who registered to vote while incarcerated –– show up to drop off his absentee ballot in person. "A brother and a sister are running. Things can change in this country," he said. When asked of he was confident of his choices, he replied, "I had a lot of time to study the propositions. I'm good." Hollenbeck Girls: First time voters Anna Sanchez and her twin sister, Regina, were dissing each others selected candidate while walking toward the community center. . –– They then both shusshed each other when they read the notice "No Electioneering Within 100 feet" posted. They walked in quietly with one voting Obama, and the other Clinton. Then they returned to their car, and one they passed the notice, they picked up the argument––in past tense. 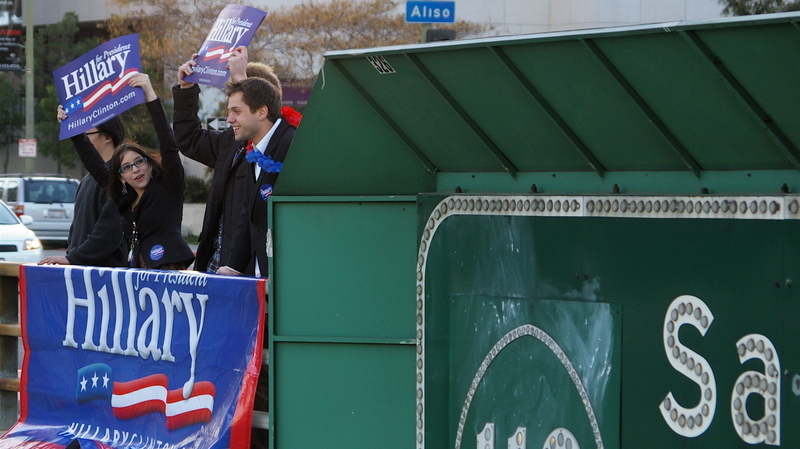 .–– It gets worse: They have an older brother, a law student and registered Republican. "We don't talk to him," they said in unison. Above: Over the 101. 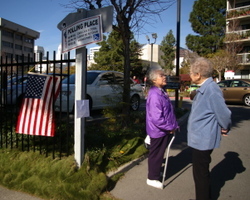 Below: One voter goes in, the other leaves at Little Tokyo Towers.